Rec’d package from Scott Lindell @ MBL containing 65 screw cap tubes in a white microtube rack. All tubes are tissues in RNA Later (presumably). One sample (MA4-5) was lost during a brief centrifugation to get tissue sample unstuck from top of tube and in to RNA Later solution. The head of the tube snapped off and the entire tube/sample was obliterated in the rotor. Also, it appears as though all the tubes leaked RNA Later solution during transport. Samples were temporarily stored @ 4C and will be catalogued/transferred to -80C. Received sets of gill tissue and hemolymph in RNA Later from Rutgers (Emily). 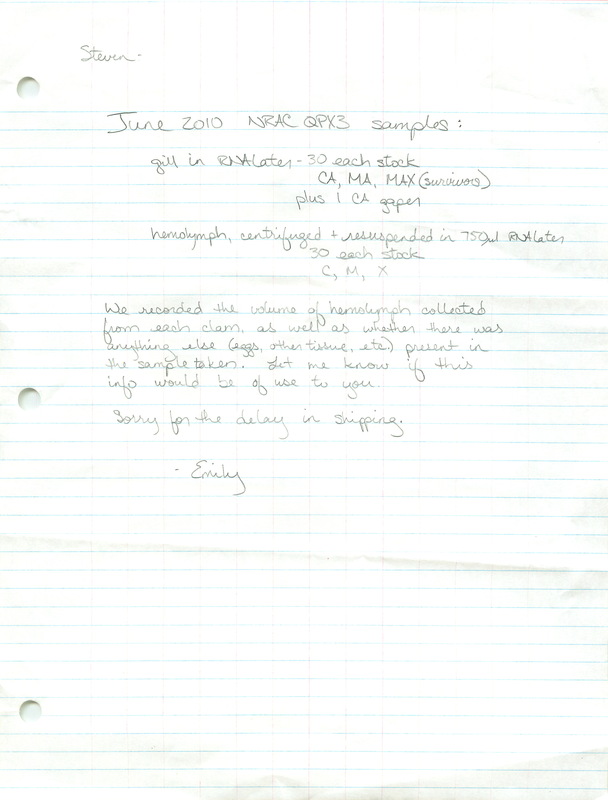 Here’s the note that was included with the samples. 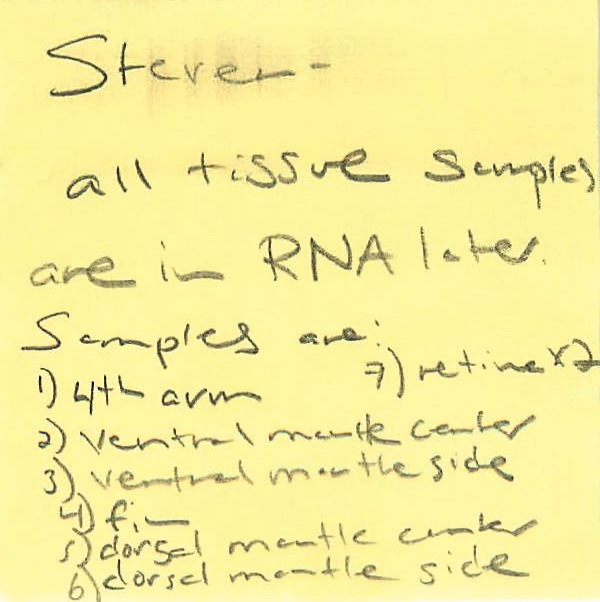 Received set of gill tissue in RNA Later MBL (Scott Lindell). All samples were stored @ -80C. Received samples from Scott Lindell today. Two Ziplock bags taped together labelled “11/16/09 Clams scudders.” The bags contain 2mL screw cap tubes with small tissue samples in RNA later. One group of tubes is labelled with FL-3 # and the other group with BX-4 #. Samples will be stored at 4C to be processed later this month. Samples were temporarily stored @ 4C. Will discuss with Steven on long term storage (if necessary). Received hard clams from Scott Lindell today. Two bags. One group (4 live clams, 1 empty shell) labelled as “FL” and another group (9 live clams) labelled as “BX.” Clams were transferred to separate plastic shoebox containers with sea water and sand. They were stored at 15C until ready for experiment. Received a shipment of various MV oysters/cod samples from Scott Lindell at MBL. However, these were NOT shipped on dry ice! Samples were put @ -80C. Will be organized at a later date.